Although our reputation may have been built upon stainless steel kitchen sinks, we also would be pleased to show you some of our kitchen faucets and accessories… if you’re interested. Enjoy your stay and please come back soon… we don’t want you to miss any new product that we are constantly adding to our line. The Kindred Collection series includes stainless steel and under-mount sinks, Granite sinks and matching faucets, and a wide array of custom accessories. Kindred Steel Queen sinks are available for every room in the house, including the kitchen, bathroom, hospitality, laundry and utility rooms. 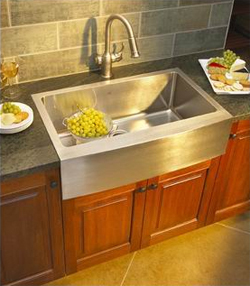 Reginox sinks are a line of builder grade product available in a variety of single and double bowl configurations. Franke Washroom Systems commercial sinkware stands at the centre of a 50 year tradition of service and excellence.